The flagship model in Hyundai’s leaf blower range, the HYB60 packs professional features and performance into a compact backpack blower at a price level that will appeal to domestic, leisure and commercial users alike. Impressive blowing capabilities have been achieved by the careful matching of all components used by Hyundai in the manufacture of the HYB60 Backpack Leaf Blower. The two-stroke air-cooled engine produces a meaty 3.3hp while the high-capacity blower fan generates a maximum air speed of 120 metres/sec – equivalent to 286mph at the air delivery nozzle. Mounted within a sturdy all-encompassing frame, the engine and blower fan’s 11.2kg weight are carried comfortably by the user backpack-style supported by a twin shoulder harness with padded straps. A large diameter tube with flexible insert transports high-speed air from the fan to the nozzle outlet tube. The latter incorporates a comfortable hand-grip that allows the user to direct the air accurately onto fallen leaves and any other debris that requires moving. All controls are mounted on the hand grip, allowing convenient, fingertip operation of the blower over short or longer periods, optimum workrate while minimising fatigue. 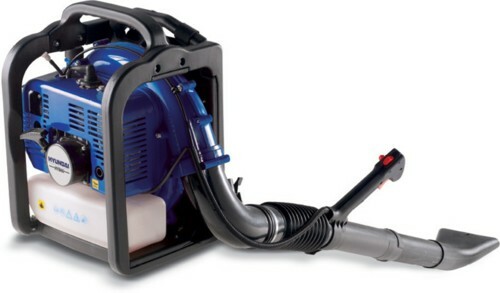 Designed to provide economical, reliable and effective blowing capabilities at any time of the year, the HYB60 leaf blower will prove equally effective on a host of clear-up tasks required within domestic and public gardens, sports clubs, amenity areas, caravan and home park sites and all other locations where it is important to maintain a clean and tidy appearance at all times. For detailed technical information on the Hyundai HYB60 Backpack Leaf Blower, please click on the Specifications tab above.